I have received numerous calls within the past week about relatively heavy aphid levels in wheat. The point of this article is that it is probably too late to spray an insecticide now to make it pay in yield. Read on for more specifics. The old adage for pest management is that species identification is the first step, most important step, and often overlooked step! This holds true for managing “aphids” in wheat (really a complex of species). 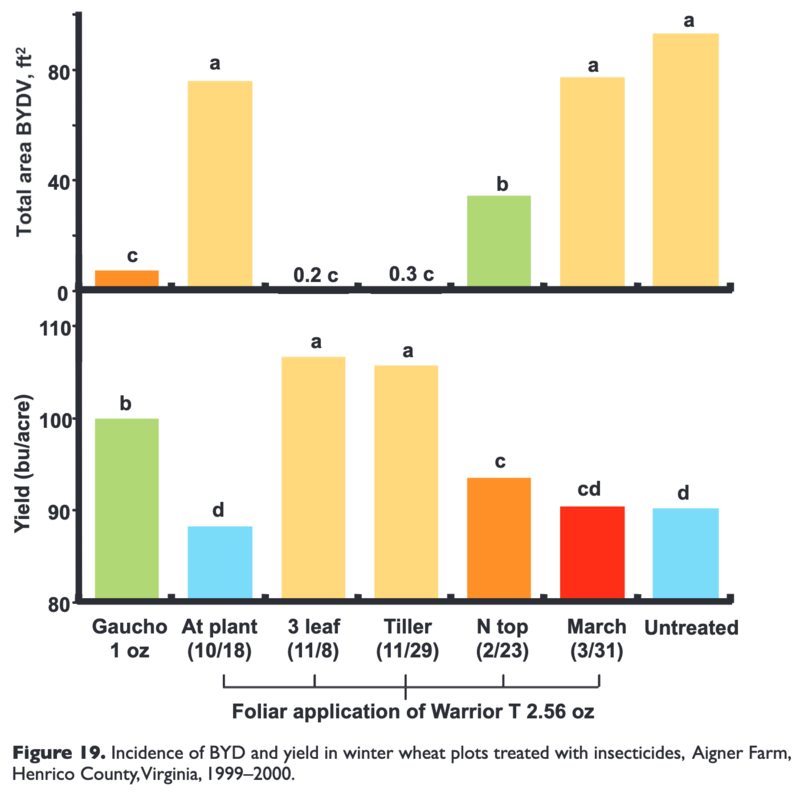 Check out the most comprehensive publication for managing aphids in Southeastern wheat. Although it is focused on barley yellow dwarf virus (BYDV), it is a great guide and can guide you through species identification (note that the thresholds published in that guide are specific to AL and GA and are more oriented toward virus transmission. NC thresholds for direct yield loss are listed in a table below). Species to pay particular importance to are the bird cherry oat aphid, the most important species for transmitting BYDV (more info on BYDV below), greenbug, a species that is most severe for yield loss, and English grain aphid, a species that tends to spike later in the season. 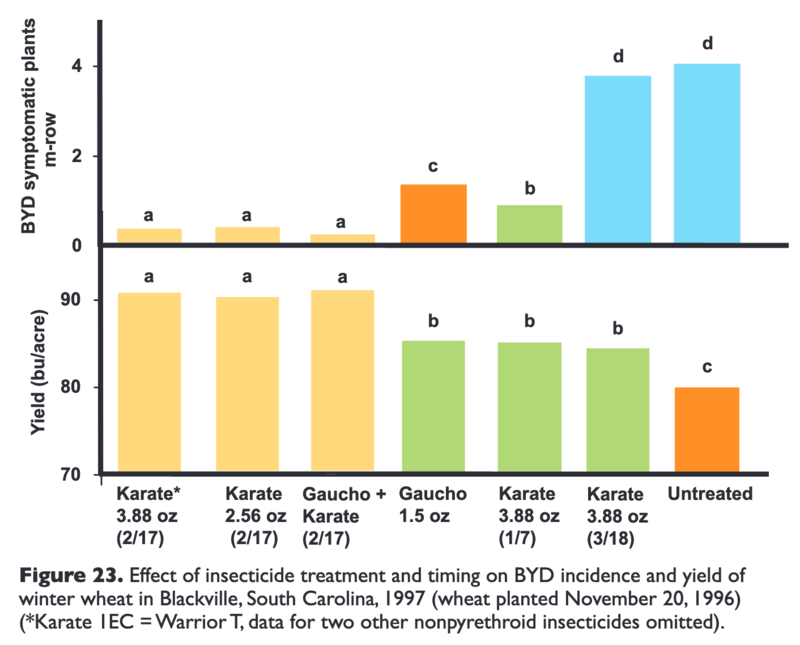 The biggest payoffs for spraying aphids come from reducing incidence from BYDV. However, in the Southeast, these sprays need to be timed in the fall or winter. Dr. Scott Stewart at the University of Tennessee has shown a consistent payoff (on average) for sprays in February using an 11-year data set. 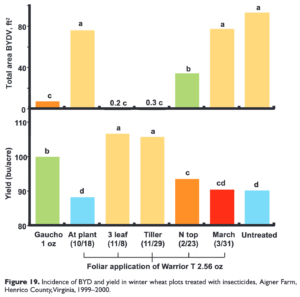 Another data set from Virginia showed the biggest payoff from spraying in November and a smaller payoff from spraying in February, but no payoff from spraying at the end of March (Fig. 1). Another study from South Carolina showed a slight payoff from spraying during the middle of March, but no impact on virus. These data all say what is known from studies across the Southeastern US. 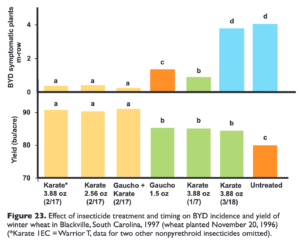 Yield impacts for sprays targeting aphids that transmit BYDV are greatest before March. Some varieties have varying levels of resistance, but a lot isn’t known about them (2015 Wheat Variety Performance and Recommendations). The greenbug can be a species of concern due to its direct impacts on yield. They can inject a toxin in their saliva that can have big consequences for the plant. If this species is present, your decision to spray just got easier. If you have greenbug (characteristic is the green stripe running down the back), then applying these thresholds is a no-brainer. Furthermore, if you’re worried about cereal leaf beetle (where has that thing been for the past six or seven years? ), you might have more reason to spray- pyrethroid residual is great for this pest. If it’s another aphid species, consider these things. First, positive returns for a spray are greatest in years with good yield potential (a lot of wheat looks good to me this year) and high commodity prices (definitely not). Second, drive down over wheat after jointing can reverse any positive impacts you might have with an insecticide spray, not to mention the cost of the trip across the field. Thirdly, in my experience greenbug is not a common species in the Southeast. In conclusion, I would wager that most fields that are sprayed will not preserve yield at levels that will pay for cost of the spray this time of the year. • Hessian Fly Adults Are Active- Should You Spray?